Nature News has announced that there are no black holes. This claim is made by none other than Stephen Hawking, so does this mean black holes are no more? It depends on whether Hawking’s new idea is right, and on what you mean be a black hole. The claim is based on a new paper by Hawking that argues the event horizon of a black hole doesn’t exist. The event horizon of a black hole is basically the point of no return when approaching a black hole. In Einstein’s theory of general relativity, the event horizon is where space and time are so warped by gravity that you can never escape. Cross the event horizon and you can only move inward, never outward. The problem with a one-way event horizon is that it leads to what is known as the information paradox. 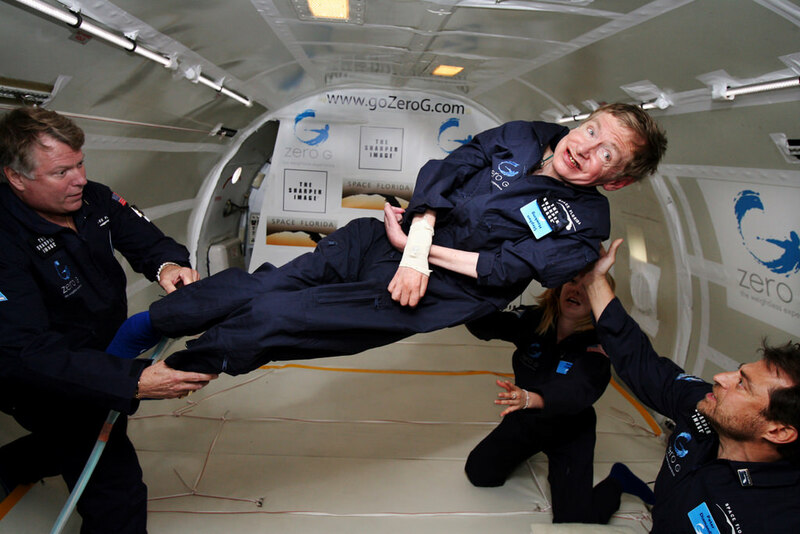 Professor Stephen Hawking during a zero-gravity flight. Image credit: Zero G.
The information paradox has its origin in thermodynamics, specifically the second law of thermodynamics. In its simplest form it can be summarized as “heat flows from hot objects to cold objects”. But the law is more useful when it is expressed in terms of entropy. In this way it is stated as “the entropy of a system can never decrease.” Many people interpret entropy as the level of disorder in a system, or the unusable part of a system. That would mean things must always become less useful over time. But entropy is really about the level of information you need to describe a system. An ordered system (say, marbles evenly spaced in a grid) is easy to describe because the objects have simple relations to each other. On the other hand, a disordered system (marbles randomly scattered) take more information to describe, because there isn’t a simple pattern to them. So when the second law says that entropy can never decrease, it is say that the physical information of a system cannot decrease. In other words, information cannot be destroyed. The problem with event horizons is that you could toss an object (with a great deal of entropy) into a black hole, and the entropy would simply go away. In other words, the entropy of the universe would get smaller, which would violate the second law of thermodynamics. Of course this doesn’t take into account quantum effects, specifically what is known as Hawking radiation, which Stephen Hawking first proposed in 1974. The original idea of Hawking radiation stems from the uncertainty principle in quantum theory. In quantum theory there are limits to what can be known about an object. For example, you cannot know an object’s exact energy. Because of this uncertainty, the energy of a system can fluctuate spontaneously, so long as its average remains constant. What Hawking demonstrated is that near the event horizon of a black hole pairs of particles can appear, where one particle becomes trapped within the event horizon (reducing the black holes mass slightly) while the other can escape as radiation (carrying away a bit of the black hole’s energy). Hawking radiation near an event horizon. Credit: NAU. Because these quantum particles appear in pairs, they are “entangled” (connected in a quantum way). This doesn’t matter much, unless you want Hawking radiation to radiate the information contained within the black hole. In Hawking’s original formulation, the particles appeared randomly, so the radiation emanating from the black hole was purely random. Thus Hawking radiation would not allow you to recover any trapped information. To allow Hawking radiation to carry information out of the black hole, the entangled connection between particle pairs must be broken at the event horizon, so that the escaping particle can instead be entangled with the information-carrying matter within the black hole. This breaking of the original entanglement would make the escaping particles appear as an intense “firewall” at the surface of the event horizon. This would mean that anything falling toward the black hole wouldn’t make it into the black hole. Instead it would be vaporized by Hawking radiation when it reached the event horizon. It would seem then that either the physical information of an object is lost when it falls into a black hole (information paradox) or objects are vaporized before entering a black hole (firewall paradox). In this new paper, Hawking proposes a different approach. He argues that rather than instead of gravity warping space and time into an event horizon, the quantum fluctuations of Hawking radiation create a layer turbulence in that region. So instead of a sharp event horizon, a black hole would have an apparent horizon that looks like an event horizon, but allows information to leak out. Hawking argues that the turbulence would be so great that the information leaving a black hole would be so scrambled that it is effectively irrecoverable. If Stephen Hawking is right, then it could solve the information/firewall paradox that has plagued theoretical physics. Black holes would still exist in the astrophysics sense (the one in the center of our galaxy isn’t going anywhere) but they would lack event horizons. It should be stressed that Hawking’s paper hasn’t been peer reviewed, and it is a bit lacking on details. It is more of a presentation of an idea rather than a detailed solution to the paradox. Further research will be needed to determine if this idea is the solution we’ve been looking for. The 3rd paragraph implies that if I manipulate a disordered set of marbles into a set of marbles evenly spaced in a grid I have destroyed information. (i.e. I have decreased the physical information of that system). Or to take the active/human element out of it, I could imagine a scenario where gravity draws a disordered set of marbles into a more ordered configuration (e.g. all marbles lying on the same plane). I wonder if this is a useful analogy for entropy, which is ideally a measure of a system’s state of thermal equilibrium. It’s not the pattern of the marbles, per se, but the information conveyed by the pattern. If the pattern contains little or no information content, then it is in a state of high entropy. A high information content corresponds to a low level of entropy, in terms of information. In your first example if you intervened in the experiment to place the marbles into a higher informational state the result of the experiment would remain the same because you had to expend energy yourself to achieve the more ordered state for the marbles. Once you account for your interference beginning at rest then radiating heat, sweating, burning nutrients, etc to achieve the increased information of the marbles. Overall order in the system would be lower in the end. That is really a confusing explaination of entropy. A better example would be to take an unbuilt house and construction crew. If you were to sequester the men and materials from the rest of the universe, measure the amount of order in the system 1st. Then have them complete the construction and measure the amount of order in the system the total order would be lower at the end even with the completed house. The reason is the same as before the men would have eat and metabolise food their bodies radiating heat as they work, the machines convert gas to CO2, heat, and energy. Thus at the finish of our experiment there is less order in the system as a whole. It is also why you can’t take all of the materials that are in a house, jumble them up and spit out a completed house even if you had an infinite number of attempts to do so. Yeah I was kinda hoping someone more eloquent than I would jump on that one. To take your gravity example once all the marbles were attracted and compressed to the center of mass at bottom of the gravity well. You would have a “uniform” state. There would be almost no information in that uniform state because in this instance it would be in equilibrium with all the marbles in the gravity well. I hope that makes sense I’ve reread it about 3 times now and can’t think of a better explanation? Where are Torbjorn or LC at? They can explain these things a lot better than I. You haven’t destroyed information, you have removed information. In physics randomness is the densest form of information because to describe it you have to describe ever single element of it, you can’t say ditto or some equivalent. By placing the marbles in a row, you can describe the state with a reduced amount of information, the position of the two end marbles, and how far marble is from the next. My understanding is that your activity organizing the marbles does not destroy information but transfers it to you, although I am used to thinking of it in heat terms. All I know is, that at one point in his career, Hawking said black holes do destroy information, and Susskind his archrival supposedly proved the opposite. Is Hawking just implicitly concurring with Susskind now, but turning lemons into lemonade, by proclaiming with fanfare that he’s determined black holes don’t exist, as by his own original definition, black holes are things that destroy information? So if event horizon’s do not exist and it is some kind of firewall, then how come there is a firewall in the first place? Magic? Alas I am not in a position to say ‘told you so’ but I do remember reading some years ago that spinning black holes would not have an event horizon. Since black holes in the real world would be spinning and presumably pretty darn quickly – wouldn’t this make sense? Please then explain it to me. If the claim is that black holes does not exist. Why is there a firewall, and how did it get there? I THINK the argument is that black holes “as we know it” may not exist. It’s like saying gravity as Newton knew it doesn’t exist…but clearly gravity still exists, just in a different form than previously believed. Maybe he just changed his view on the matter. There’s no shame in accepting and learning from a past mistake and presenting a new hypothesis 🙂 After all even Einstein had some pretty bad ideas. If I throw a rock in a pond, there is a splash, and there will be ripples. Eventually, the ripples subside. Isn’t this a reduction of entropy? From what I gather a more accurate title would have been “event horizons do not exist.” He’s not disputing what happens in a black hole, only that matter/energy wouldn’t interact (or fail to interact really) with it in the way that theory currently predicts. Second law is not a law, but the solution to homogeneous direction independent random. Does not hold in a force field. “the entropy of a system can never decrease.”? Quick, someone tell Marty! His show… AFM’s ‘Event Horizon’ may no longer have a place in our space-time! Well even without Stephen Hawkins new ideas there are no event horizons now within the universe, the physics says that time grinds to a halt at the event horizon from out perspective therefore nothing it would take an infinite amount time for the event horizon to form. I would also think that if the event horizon takes and infinite amount of time and the black hole doesn’t have and infinite life space from our perspective then the event horizon would never exist, but this doesn’t seem to be the standard view among physicists, not sure why. You are right. From our point of view as an observer, it takes an infinite amount of time for any particle or photon to cross the event horizon of a black hole. Which means that since the big bang, not a single particle has ever fallen into a black hole anywhere in the universe. How then can any black hole ever form or evaporate? So any astronomical black hole can not actually be a black hole, but is a kind of frozen star on it’s way to become a black hole. Well I have read that Hawkins radiation doesn’t require a complete event horizon, so these black holes will evaporate, Hawkins radiation is very slow from our perspective, but from the perspective at the centre the rate would be extremely quick, I guess approaching instantaneous as you approach forming an event horizon, so the black hole would evaporate, if you were to fall into a black hole and survive, you would see it evaporate (more like explode) in front of you and you would come out the other side, gazilions of years into the future. I have personnel wonder what the space dilation effect would do at the from the perspective at near an event horizon, I would have thought if you could get an event horizon you would have an infinite amount of space compressed along the event horizon, so the black hole is approaching a bottomless pit, but I haven’t be able to find anything about this. The event horizon is only formed after enough mass has has concentrated beyond the distance if an event horizon. Also mass falling in already fell into the black hole ( mass local time). We only see the mass delayed. Yes but as the mass collapses and an event horizon is approached, time grinds to a halts from out perspective. When the event horizon forms from our perspective is infinitely far in the future, but the black is supposed to have evaporated in a finite amount of time, so the black hole evaporates away before the event horizon forms from our perspective, so what happens from the perspective at the centre? Would the rate of evaporation must be must approach infinite the closer to an event horizon you get? For us outside the event horizon we see the object falling in taking time forever. But for the object it gets inside the event horizon instantaneously. What happens is that at the event horizon matter-anti-matter pairs are formed and when an anti-matter particle gets inside the black hole then that will annihilate a matter particle that it encounters reducing the mass of the black hole inside the event horizon. But there is a contradiction there because from the outside perspective the event horizon doesn’t get a chance to form, it evaporates away before then, but from the inside persepctive it does form and then evaporates away. It shouldn’t even be called a black hole, I think black holes are just colossal super massive stars. This almost sounds like a cover up for all the scientists that said nothing can escape a black hole once gravitationally attracted by it. Personally, on querying scientists about the now known issue of high energy jets overcoming the gravitational pull of a black hole, I had it refined to and accurately explained that nothing could escape once it crossed the event horizon. ¿Is the whole thing being swept under the carpet? ¿Are some scientists afraid to admit that they were wrong? No one is perfect but hey, admit to it, it doesn’t hurt. In the universe, there are two entities: the invisible part of a spiritual entity where you can not get a visa to study , and the other entity is formed of matter and energy that originated from the unseen ( spiritual entities) . There must be a circulation between the two entities. Through the white hole is formed of materials with all related properties under gravity gathers material in the form of masses of various celestial bodies . The force of gravity and other laws of motion mass gathering mass until it gets critical mass at which gravity becomes so strong that the mass of ” melted back again into an invisible entity , and that of the black hole. Gravity is not what science thinks , nor material due to chance . there are no accidents in the universe because it’s all controlled by a spiritual entity. big mistake and a big bang that never existed , so that it comes to the theory of relativity , Lorentz transformations , and almost everything related to the error. nature is much simply made ? ?a chain of processes by which it unfolds eons years, and people want to tower and such infinite power of the Creator of the universe .